In February 2007 I posted an item on bands featuring female vocalists who might have performed at the Pop House. (See: http://pophouse.accardiweb.com/?m=200702). A few days ago I received an email from Steve Seymour in Escanaba, Michigan who writes a weekly column about music in the Upper Peninsula. (See: http://rocknrollgraffiti.com/). Steve had just met with Tom Lucas, formerly of the Ravelles from Iron Mountain. The band toured the Midwest and also had been the opening act for the Cryan’ Shames and the Buckinghams. If you recall, I had spoken with John Richtig and Carmella Altobelli of the Ravelles and asked if they remembered playing at the Pop House. Neither could remember. Lucas, however, had a copy of Richtig’s journal that he kept about the band and its accomplishments. 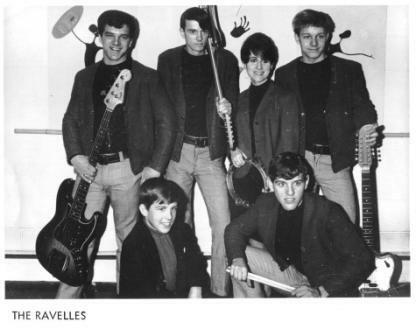 It was noted in the journal that the Ravelles performed at the Pop House on Oct. 12, 1968. The dance lasted from 8:30 to 12:30. They were paid $300. Richtig said about 250 kids arrived after a football game. “Kind of a long trip, but it went pretty well anyway,” Richtig wrote in his journal about the appearance. So there you have it. Too late for the book, but an interesting anecdote for the blog. Thanks to Steve for sharing this story. Another band featuring a female vocalist was Marcia and the Lynchmen from Minnesota. Marcia Wilcox, who joined the group as lead vocalist when she was only 16, was also among the first female singers in a Midwestern rock band. The band toured the Midwest for a number of years, playing teen clubs, ballrooms, and nightclubs. They also had been an opening act for the Buckinghams and cut one single, “Won’t Turn Back.” The exact date of their appearance at the Pop House was unknown, but a number of alumni remembered them. Marcia and the Lynchmen are one of the bands featured in the book. If you remember either of these Midwestern bands, you can share your memories on the blog. Thanks.